Strategy and planning are the heart of great leadership and management. Why? Because a goal without a plan is just a well intentioned wish or hope. As a leader you need to become great at planning. When I was a line manager I loved weekly planning. It peaked each week on a Friday afternoon, when my team would agree our goals and plans for the coming week. I loved these meetings. To me they were a microcosm of everything it means to be a leader and a manager. Below is an outline of my weekly planning flow back when I was a line manager, managing eight engineers on our operations team. Hopefully some of these strategies will be helpful to other managers out there too. Monday is always a special day. It starts a new week, a new cycle and a new sprint. As a manager, it’s important to lead by example, to model the behaviors and attitudes I expect from the people on my team. To get myself into the right frame of mind, on the way to work I might listen to some upbeat music or listen to an inspiring speech from an Irish sporting legend. Anything that gets you motivated will work. Next I re-read through my team’s goals for the week, making sure I know exactly what they are, why we’re taking them on, what success looks like, what the risks are, who should be doing what and which of them we’d like to demo or showcase to other teams at the end of the week. Why? Because achieving goals, knocking them out of the park and adding as much value as quickly as possible is what a good manager is there to do. a way for teams to be held publicly accountable for hitting their weekly goals. Our custom-developed tool, Muster, that manages our infrastructure and how we deploy. Next I load up on all other secondary contexts I need to help me and my team plan and execute well this week and this day. any new bugs or Github issues that were tagged for my team and updated since our last standup. any pages that fired for our team since our last standup. our key operational metrics dashboards looking for anything out of the ordinary. all the high level goals being taken on this week by other relevant/adjacent engineering teams. From these things I decide and note down anything that I might need to bring up with the team at standup. Standup happens at 9.30. I like to be first to stand up, to arrive with a smile on my face and set the tone – happy, positive, optimistic, organized and eager to get started. We go around the room, asking each person to quickly and succinctly remind the team what their goals for the week are and what they’re aiming to get done today. Sometimes I’d ask someone else to paraphrase what the last person just said to make sure we all understand what each other is doing. This is an extremely useful technique, because if we don’t understand what everyone else is working on we can’t help. After sharing weekly goals and tasks we move on to “post-scrum”. It’s not actually scrum we’re practicing, but we still called it post-scrum. Old habits die hard. Here we’d discuss any of those things I’d jotted down from my pre-standup review and anything else other folks needed to discuss. This post-scrum bit usually takes about 5 mins. Highlights from last week. What were the top three things we accomplished and why you should care? Goals hit. Which of our goals did we hit and what was the value of doing so? Goals missed. Which of our goals for the week did we miss and why? Goals for this coming week. What are we committing to achieve this week and why? A lot of people complain about status reports. People say they don’t have the time to write them and complain that nobody reads them. My two cents: If you don’t have the clarity of understanding to be able to quickly write out those four points in 30 mins or less then you have a bigger management problem that needs addressing. Regardless of who reads these things (and senior people read them more often than you think) the public act of accountability keeps you honest and motivated to improve. Pre-standup planning is pretty similar as before. Prior to standup I follow the same checklist as was already listed for Monday. At the standup we go around the room and say what we did yesterday, what we’re doing today and what we’re blocked on. I also ask each person whether they’re on track to hit their weekly goal to and to explain and justify the answer. Any goals that are on track get green dots beside them. Any goals that are not on track get red dots beside them. If a goal is off track for more than one day we figure out ways we can help the person or re-scope the goal to something achievable but still valuable. This re-scoping, helping and generally fighting to never let a goal go gently into the night is what we call hustle. It’s magic. Tuesdays are for a 1:1 with my boss. I’d spend some part of this 1:1 to bring him up to speed with how the team is doing this week and get any input/context required for future planning. Managing up is one of the most important things you can do. Wednesdays are for 1-on-1s with my direct reports. A part of each 1-on-1 is talking about how things were going during the week and what we thought should be done next week. Generally I’m asking more questions than I am giving out advice. I’m trying to use as much of a coaching style as possible to give as much autonomy for folks to create and drive their own plans. When it comes to management, Coaching + Autonomy = Growth+ Accountability. The Friday afternoon team planning meeting is the most important meeting of the week. It’s an expensive meeting for a start. It’s an hour long and everyone attends, so it’s a huge waste of time if everyone, myself included, doesn’t come prepared. It’s also really important because this is where goals and plans for the whole team get made for the coming week. This is where my serious Friday pre-planning starts. For the rest of the day, for the next 3 hours, I’ll be “pre-planning” or “planning”. I have a checklist of things that I go through to get me ready to run our planning session at 4pm. Re-read our team’s mission and values. Am I happy with how we’re performing against them? Review our quarterly roadmap and goals and assess how well we’re doing against our bigger commitments. Are we still working on the right things? Are we moving fast enough? Is our quality bar high enough? Review our key metrics and operational dashboards and zoom out and see if there are any trends to spot. Think about my own performance. Am I helping? Am I innovating? Am I pushing outside of the comfort zone or am I coasting? Am I happy? Am I proud? Think about the folks on the team. Who’s doing well and who needs to do better? Who’s stressed or tired and might need a break? Am I proud of our team? Where do I rank our team amongst the other teams I know of at Intercom? What does it take to get/keep our team as the highest performing team at Intercom? I always want my team to be the best team at Intercom and if that’s not what I’m shooting for then I’m letting people down. At 3pm I put together the agenda for the impending team planning meeting that will happen at 4pm. I try to make sure I’ve a good idea of the work / goals that folks will need to do next week and as much as possible have it jotted down already in my notepad. I want to spend as much time as possible with my head up looking at people, being present, listening, asking questions, talking, leading and as little as possible taking notes. It’s important to decide whether this is going to be a “sustaining success” planning meeting where I dole out recognition, highlight the things we’re doing well and generally try and keep the high tempo of the team on track for another week, or whether this is going to be a “get back on track” planning meeting, where a retrospective is needed or where I need to reset the tone, expectations and ambitions of the team to be something better than what it currently is. I practice everything that I want to say. I say things out loud to see how they sound. Sometimes I roleplay it with a peer. Roleplaying is for management what code review is for software development. At 4pm the team all come in to our meeting room. We start with accountability. We kick off the meeting by closing out on our goals for this week. Which goals were hit, which were missed and which can be demoed to our peers. 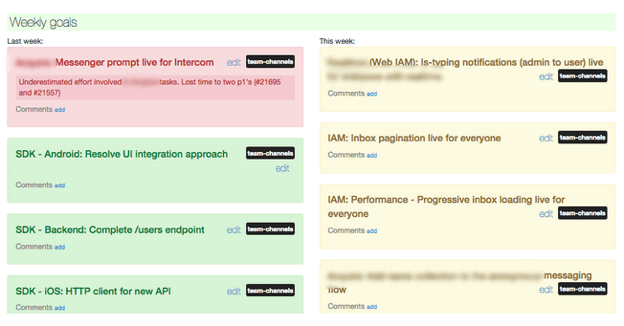 It’s always a yellow/red flag for me if there is nothing that we’d like to demo to peers. It means we’re probably not scoping things as well as we should. This will all be fast, because I’ve already gone through this in the previous few hours. I’ll draw attention to anything that’s important so that we can quickly and efficiently discuss it as a team. Next I’ll run through our mission, values, roadmap and goals to remind people of the bigger picture. I do this so often I can nearly sing it. We’ll talk about whether the goals are on track or behind. We should see the coming week within the right context of bigger goals we’re shooting for. Now, fully loaded with context we go around the room and share individual goals for the coming week with each other. I mostly have these all written down already from my questions earlier in the day. I make any minor adjustments as necessary. I’ll often ask person X for feedback on person Y’s goals. Sometimes this is to make sure everyone understands what’s being discussed, other times it’s to get real feedback and insight on how the goal/plan can be improved, and sometimes it’s just to make sure everyone gets a chance to contribute and have their opinions listened to. From our list of goals for the next week, I’ll ask which of those we intend to demo next week. This will help put an even finer focus on what needs to get done next week. Finally, I’ll read out the meeting minutes and sum up what we’re committing to as goals for the coming week. It’s important that there are no misunderstandings and that we’re all clear on what we’ll be doing and trying to achieve next week. I’ll thank everyone and hope they have a great, relaxing weekend! The coming Monday will be another magical day and we’ll be ready to start afresh with our best foot forward ?